I’m remiss. No excuse other than I plain out forgot. Three weeks ago (or maybe four) I announced that hubby and I were off to sunny California for a week, actually 9 days—that morphed into 13 lovely days. At the time I was trying to decide which book to read on the flight/trip, either Michelle Willingham’s Surrender to an Irish Warrior (I LOVE this series), or Brenda Novak’s suspenseful The Perfect Liar. I promised to let you know which I chose ‘in two weeks’, after the trip and I had a chance to read whichever book I selected. Well, that’s what I forgot to do. I came in here instead telling about our new dog, Molly-the-Jack-Russell-Terrier. Oh, how I fell hard for the little dog. 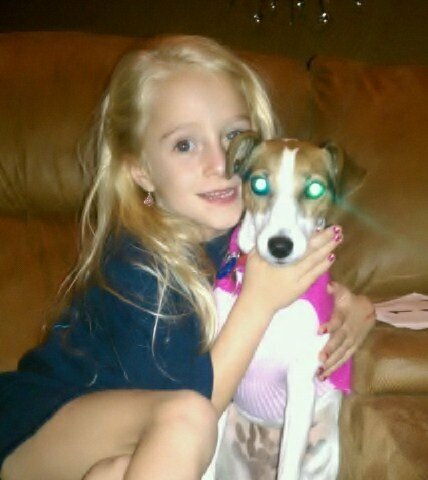 Unfortunately, so did hubby’s client’s 5 yo daughter who had recently lost her Jack Russell. I felt bad for her, really. She loved her dog, took her everywhere in cute little outfits. I knew it was fate when her mom and dad told us the missing dog was named…Molly. I cried as I allowed my sweet Molly to go into a loving house to cheer up a small child. I get to see her and she hasn’t forgotten me. But, I cry each time I have to leave her all over again, even though she’s very happy. ANYWAY… so, for the trip I thought about turbulence and my not to comfortable willingness to fly—don’t planes fall from the sky?—and so I chose Brenda Novak. Suspense won over hunky Irishman…this time! And guess what? I still haven’t finished it. I got home and dove right into Perfect Doctor Viv, my HQ Medical that is supposed to be back in me editor’s hands by Christmas. Aren’t I a good girl? You can check and watch the progress of this building love story waaayyyyyy down at the very bottom of my blog page, along with progress of HOME. Don’t remember HOME? It’s the Vietnam story I began back in July. It’s almost complete now, in the hands of critiquers for the first time. I still have the black moment (BBM) to finish, but I’m waiting to see how it flows this far before I do. So busy, busy me this month. Happy to be getting words on paper at a steady rate. So look me up, follow me @CalisaMS (no pic currently), or Facebook me @ Calisa Selfridge. Look for the same picky as is my blog profile pic right now, but it will change soon so hurry! Posted on 11/05/2010, in Pen of the Dreamer. Bookmark the permalink. 4 Comments. >I was hooked when the first one came out three years ago. I just wasn't able to find them as they released after that one. Now I'm playing catch up! Thanks. I'm happy for her, but sad for me. But, I'm such a clingy baby about these kinds of things. I still whine over the horse I raised from 5 mos old, and had to sell– 6 yrs ago! I keep telling hubby "When you win us the lottery I'm going to California to find and buy back Doc!" LOL Can you say 'separation anxiety?